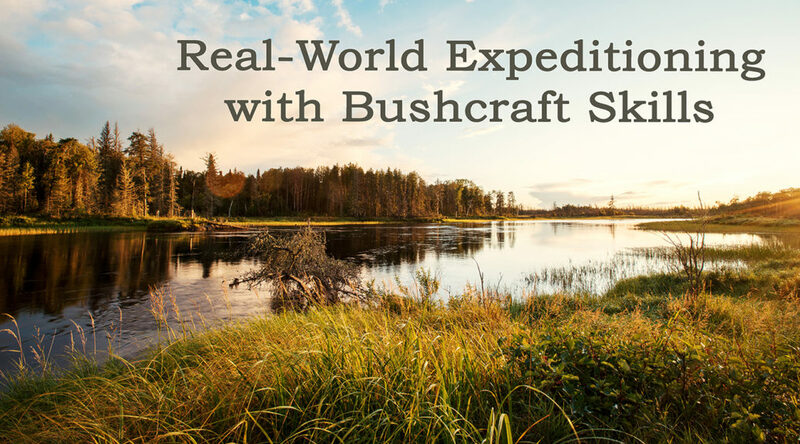 Real World Expeditioning With Bushcraft Skills was the title of my main stage presentation at the 2018 Bushcraft Show. Much of what we consider bushcraft today was tied to journeying in the past, whether it was seasonal migrations of native peoples, frontiersmen pushing into new territories or colonial powers employing expeditionary forces. Despite all the technology and materials available today, bushcraft still has a solid place in modern expeditioning in wild places. From lightweight backpacking to canoe tripping to winter camping by snowshoe and toboggan, bushcraft forms a solid backbone of practical skills for pretty much any environment you can think of. Further, there are psychological benefits of entering wild places with a strong base of bushcraft skills honed close to home. In this presentation I explore and expand upon these concepts, highlighting the bushcraft skills which I have found valuable in a career of wilderness expeditions and which you can benefit from learning then applying wherever you choose to have your adventures. 2018 was the fifth time I have been invited to be among the expert speakers at the Bushcraft Show, which takes place every year in Derbyshire, England. Other speakers this year included John “Lofty” Wiseman, Dr Sarita Robinson, Ed Stafford, Dave Canterbury, Luke Soderling, Barn the Spoon, Will Lord, Fraser Christian and Dan Hume. I had a speaking slot of 1 hour on Sunday afternoon at the show and I gave a 55-minute presentation on my topic. I recorded the presentation and have edited into the footage all of the 180+ slides included in the presentation. Even if you were at the show and attended my presentation, you will benefit from watching this video as it was hard to see the projected images at the live event other than if you were in the front couple of rows. Also, the projector seemed to subside during my talk, leaving the slides in the latter part of my talk only partially visible as well as skew whiff. Watch the presentation in the player above or you can also watch the video on my YouTube channel here. To get the resources mentioned in the video, just request them here. Hi Paul. I was at the bushcraft show 2018 and watched your presentation live on the day. I found it very insitefull and I formative. I really enjoy your open and honest no frills delivery. Hope to meet you in person for a hand shake at the show next year if you are there. Thank you for taking your time to produce the videos, blogs and podcasts. Thanks for attending my presentation at the show. I really appreciate you being there. Please do come up and say hi next time you see me. It’ll be good to shake your hand too. I’m glad you enjoy the videos, blogs and podcasts and I’m grateful to you for taking the time to let me know. Enjoyed the talk Paul and looking forward to adding to my (currently non-existent!) canoe expedition skills in Windermere with you and Ray in a few weeks. Improving my ability to experience nature and have improved confidence in journeying is absolutely what has led me to study bushcraft. Thanks for sharing. I’m glad you enjoyed this talk and I’m very much looking forward to seeing you in the Lakes. Thanks for sharing your experiences and information. Well done. A brilliant presentation on how taking time and effort to practice and sharpen bushcraft skills really come into their own when on bigger journeys.im glad you took time to record this talk as unfortunately I didn’t attend this years bushcraft show.keep up the great work.im looking forward to attending another coarse and learning more skills from you and the team at frontier bushcraft. First of all I want to thank you very much for all your hard work on your youtube channel, websites etc. I am not a bushcrafter. Or maybe I am. I don’t know. I like the “concept” behind the term bushcraft. I like some skills and techniques. Some of these are essential for my hiking around the world project. Leave no trace is a very good idea of bushcraft. And I think the UK is very special when it comes to talk about bushcraft. Unfortunately I had to stop my trip in Britain because of serious health problems. But I want to continue the trip hiking through each and every country on planet earth. And I want to make a new start in Britain. For many reasons. I would like to get a trainig by your school. I thinkdieit is a good idea. I was a teacher for survival techniques in the german and danish armed forces. But survival is not bushcraft. Survival is acting as a bulldozer in the nature. Bushcraft is acting as a part of the nature.